Volvo returns to the U.S. station wagon market in January with the V60. Volvo will market its V60 station wagon only on the Internet and will rely heavily on social media to promote its return to wagons after a three-year hiatus. 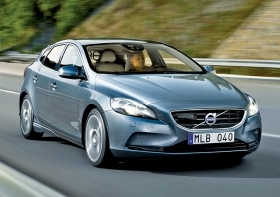 The V60 will go on sale in January as a 2015 model. Volvo built its image in the United States on safety and station wagons. But in 2011, the company stopped importing the last wagon it sold in this country, the V50. "The headline will be the wagon is back," Tassos Panas, vice president of marketing and product development at Volvo Cars of North America, said in an interview. "Volvo wagons have an iconic status. We are trying to tap into that. We will play into the heritage and have stories. We will leverage the status of the vehicle." Pricing has not been announced for the V60, which shares its platform with the S60 sedan and XC60 crossover. Volvo expects to sell about 300 V60s a month. "They are not huge volumes because the size of the station wagon segment isn't that large," Panas said. The V60 will be the first car to use Volvo's new family of four-cylinder Drive-E engines. Two gasoline versions will be offered, with 240 hp and 302 hp. Drive-E engines eventually will replace all Volvo four-, five- and six-cylinder engines. Volvo has not given a timetable for phasing in those engines. Drive-E engines will weigh nearly 100 pounds less than some current Volvo powerplants and will use 13 to 26 percent less fuel. The engines can be used in a hybrid system, but Volvo has not announced plans for a hybrid version in the United States. Volvo did not initially plan to sell the V60 in the United States because station wagon sales have dwindled. But the U.S. sales arm and dealers lobbied the company for more than a year to reverse the decision.